From 1917 until 1979 Girl Scouts of the USA published a magazine, originally called "The Rally" (1917–1920) and then "The American Girl", with the 'The' later being dropped (not to be confused with the currently published American Girl magazine). At one time this magazine had the largest circulation of any magazine aimed at teen-aged girls. Chris Wild at Retronaut has compiled a collection of The American Girl covers—Enjoy! 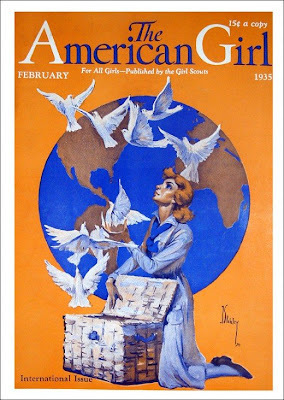 Do you have any vintage copies of "The American Girl"?